Stan Lee (1922 – 2018). As I recall, The Comic Reader got in a few letters of comment regarding this cover from 1980, where some folks didn’t appreciate the April Fool’s shenanigans. But I’ll tell you, the second I heard the news today, this was the very first thing that came to mind. Well, we had Stan around a few decades longer than that gag image above would have had you believe, and I know there’s some discussion within the fandom and the industry about what exactly his legacy is. But, for the public at large, he was comics, and generally a positive representative for the medium. 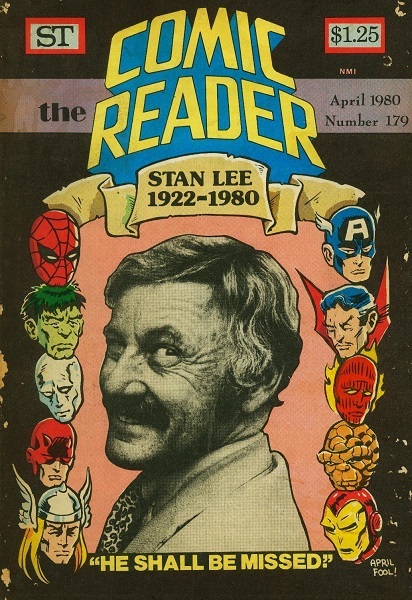 People liked Stan, and they liked to see him, and by extension that improved the perception of comics as a whole, I think. That’s not a bad thing. And, in collaboration with spectacular artistic talent like Jack Kirby and Steve Ditko, he wrote some of the best comic books ever published, and helped redefine just what a comic book was and what it could do. I’ve said before that the Thing isn’t just one of the greatest characters in comics, but straight-up one of the greatest characters in fiction, and it was Stan’s voice in combination with Jack’s pen that brought that ol’ bashful Benji to life. For that alone, Stan (and of course Jack) would deserve immortality. I wish his final years had been a bit easier on him, but at the very least I think he knew how many people loved him and his creations. He was Imagination Incarnate, the Power Cosmic of Comics and there will never be another one like him! Rest in peace, and thanks for my favorite hobby! I think really epic issues like FF #48-50 or ASM #31-33 are probably more Jack’s and Steve’s. But I think there are some issues–some of my favorite issues ever– where the contribution of the dialogue and characterization is what makes the comics, and that was mostly Stan’s department.